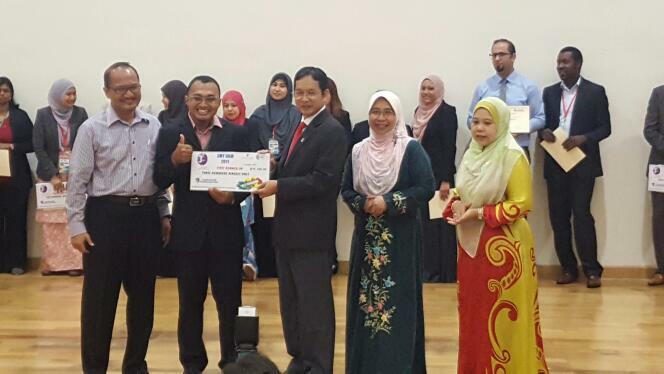 A PhD in Accounting candidate, Ahmad Zainal Abidin, won first prize during the Finals of 3MT Competition UKM, The competition was held on 4 April 2017 at UKM Graduate Centre Lecture Theater and officiated by YBhg. Prof. Dato` Ir. Mohd. Marzuki Bin Mustafa, Pro Vice Chancellor for UKM Corporate and Strategy Development. Eighteen postgraduate students from Science and Technology, Social Science, and Engineering clusters participated in the event, and prizes were presented to top three from each cluster. Three candidates were selected to represent UKM to the national level that will be held on 18 May at Universiti Sains Malaysia. Ahmad’s winning the first place for the Social Science cluster and second overall was also celebrated by his supervisory committee, chaired by Assoc. Prof Dr Zakiah Muhammadun Muhamad who had just passed away on 7 April 2017. The other committee members include Assoc. Prof Dr Noradiva Hamzah (FEP) and Assoc. Prof Dr Zurina Shafii (Universiti Sains Islam Malaysia). Faculty of Economics and Management was also represented in the final competition at UKM level by Wan Farisan Wan Sulaiman, a PhD in Economics candidate. His supervisory committee include Assoc. Prof Dr Zulkefly Abdul Karim (chair), Dr Norlin Ahmad and Dr Riayati Ahmad. Congratulations to all the winners of the Finals of 3MT Competition UKM, especially to Ahmad Zainal Abidin.